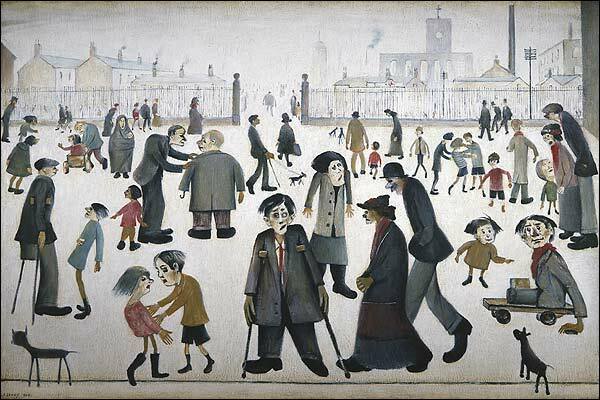 Tate Britain’s latest exhibition, Lowry and the Painting of Modern Life, is dedicated to the work of LS Lowry, and attempts to place the artist in a league with the masters of Modernist painting. It is clear that Lowry’s paintings of industrial Salford and Manchester capture an aspect of modern times that is unique. His landscapes, such as The Pond and Bargoed, lay bare the results of industrial change on traditional landscapes. No artist compares with Lowry in conveying the working class crowd; the sense of mass motion towards the mill or the football game in paintings such as Early Morning or Going to the Match. But one problem I have with this exhibition is the lack of nuance in Lowry’s depictions of individuals. The figures in his work are so overwhelmingly devoid of character or agency that they evoke only fleeting sympathy or total ambivalence. This perhaps reflects Lowry’s own point of view; a rent collector observing the lives of the industrial working class. Lowry the outsider seems to fail to engage with his subjects on a human level. There is none of the mystery or excitement at observing individuals in a changing society which is captured in the work of French Modernists. The exhibition guide makes reference to Lowry’s ‘grim compassion for the common man’, but nowhere in this show can I sense any such emotion. Here, Lowry remains detached from the people he paints. They are either anonymous figures in the crowd or, worse, in the case of The Cripples, crude, pathetic caricatures paraded out under the bourgeois gaze. Lowry’s work continues to divide critics. There is no doubt to me that Lowry’s landscapes and city scenes are impressive as individual stylised snapshots of a changed world, and his relentless dedication to this subject throughout his career is certainly extraordinary. But I must admit to being left cold by Lowry’s seemingly endless repetition of almost identical scenes with no variation in style or mood. The effect wears off quickly in an exhibition of almost 100 paintings.